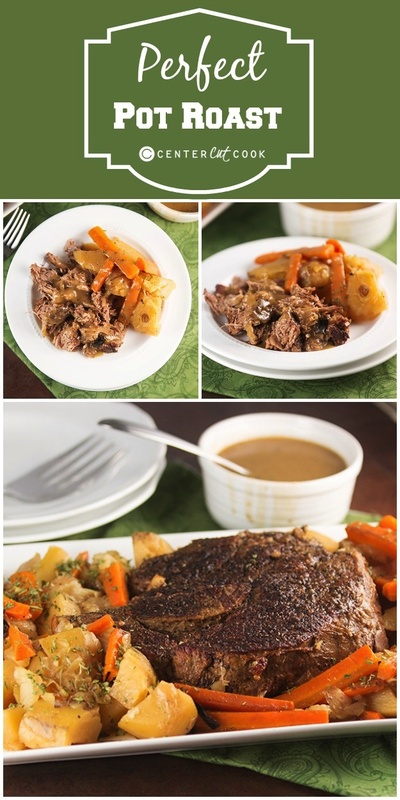 The Perfect Pot Roast Recipe with instructions to make it in the oven or slow cooker! Seasoned just right and served with homemade gravy and tender carrots, onions and potatoes, this will be your new go-to recipe! When I think of a list of ultimate Sunday dinner ideas, pot roast is high on the list. It’s the dinner my mom used to make so often for Sunday family dinners. She’d start the pot roast in the crock pot before we left for church in the morning and by the time we got home, the house smelled UH-MAZING. Today I thought I’d share the Perfect Pot Roast recipe with you. While I made this in the oven, I will also include instructions for those of you wanting to make it in the slow cooker. It is seasoned just right and served with homemade gravy and tender carrots, onions and potatoes. It’s the perfect Sunday dinner! The key to an exceptionally amazing pot roast is to brown it really well. Browning the meat really helps to seal in all of that delicious beefy flavor! While this does take a little bit of extra time, let me assure that it is so very worth it. Also worth the time and effort is browning the onions. It’ll add tremendous flavor to EVERYTHING! 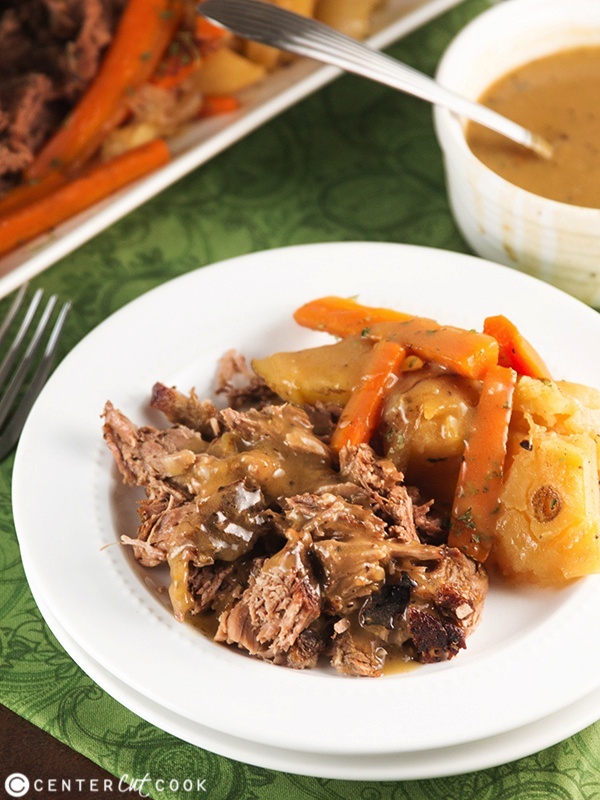 I know some of you love to use your slow cooker to make pot roast, so included are instructions to make it in the oven, or in your slow cooker. Both cooking methods turn out phenomenal, so just choose the option that works best for you. I’d like to give a big shout out to How to Geek who shared this recipe with me! Not only is he exceptionally knowledgeable in all things geeky, he also knows how to make a mean pot roast. If you are ready to rip your hair out because you can’t figure out why your computer is doing something, or you want to figure out how to backup your iPhone or iPad, How to Geek is going to have the answer you’re looking for! Now…. 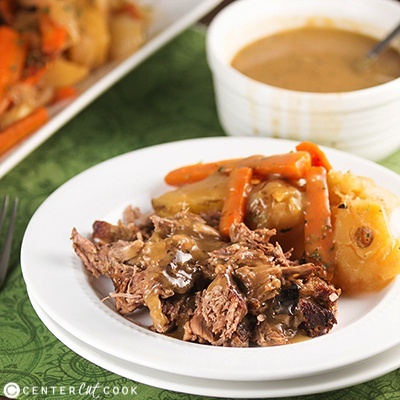 please excuse my bossiness… go make this pot roast and enjoy!. Pre-heat your oven to 275 degrees. Use paper towels to pat the chuck roast dry. Liberally season both sides of the roast with kosher salt and coarse ground black pepper. This is important! Heat 2 tablespoons olive oil in a large dutch oven over medium high heat. When hot, add the roast to the pan. The goal during this step is to brown all sides of the roast really well. You’ll need about 3-4 minutes per side. When the bottom of the roast is browned well, use tongs to flip the roast and brown the other side. You can also brown the sides if you wish, just use tongs to hold the roast up as the sides brown. Remove the browned roast from the pan and set aside. Add a bit more oil to the pan if necessary, then add in the onions and brown them on all sides. They might look a little burned but this is what you want. Return the roast to the pan, placing it on top of the onions. Arrange the carrots and potatoes on the sides of the roast. Add in enough beef broth so that the sides of the roast are covered, about 4 cups. Bring it up to a gentle simmer, then cover the dutch oven and place in the oven for about 4 hours for a 4-5 pound roast or 3-4 hours for a 3-4 pound roast. When the roast is fork tender and will easily fall apart, it’s done. Carefully remove the roast from the dutch oven. It is going to be super tender and a little tricky to transfer to a large plate. Remove the onions, carrots and potatoes as well. Return the dutch oven to the stove with just the liquid remaining. Heat over medium high heat for about 5-10 minutes. To make the gravy: Make a roux – In a small saucepan, melt 1/4 cup butter over medium heat. Add in the flour and whisk really well. Allow the roux to cook for a minute or two. Mix the roux in with the liquid and whisk really well. Simmer for about 10 minutes, or until the gravy has thickened a bit. Season the gravy to taste with additional salt and pepper if you wish. Use two forks to shred the meat, or cut it across the grain into slices. Serve the roast with onions, potatoes, carrots, and gravy. Transfer the onions to a large slow cooker. Place the roast on top of the onions. Arrange the potatoes and carrots on the side of the roast. Add in enough beef broth so that the sides of the roast are covered. Cook on low for 8-9 hours, or on high for about 4 hours. When the roast is fork tender and will easily fall apart, it’s done. 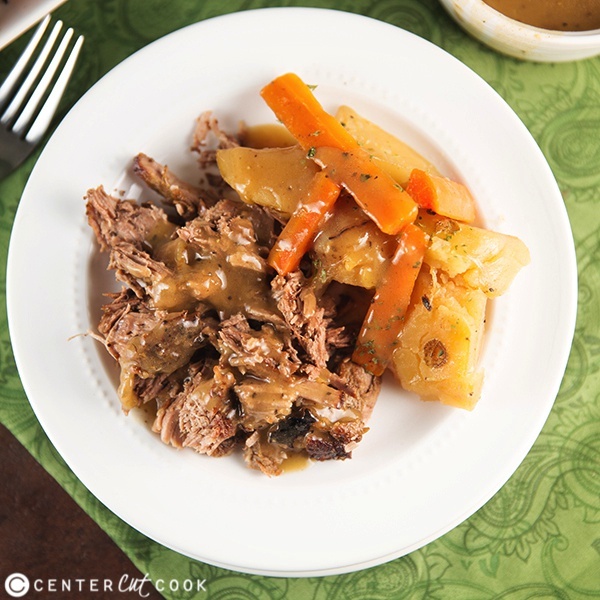 Carefully remove the roast and veggies from the slow cooker and transfer them to a plate. Cover with foil. Pour the remaining broth in a large stock pot and simmer over medium high heat for about 5-10 minutes.